Hello friends! It's thirsty Thursday. Thought I'd share a little cocktail concoction I mixed up recently using some of the things I had at home. Elderflower liqueur is one of those magical things that I could go on about for hours. This delicious syrup, made from the buds of the Elderflower blossom, is this incredible combination of pear, lychee and lemon, with lilting floral notes. It reminds me of rolling hills of green, sweet nectarines, and all those beautiful pastoral images. It's an amazing combination. An unbeatable concoction. If the Rossini+Mint champagne cocktail represented the summer, then this lovely spirit embodies the spring. it's also unbearably difficult to find on our tiny island. Seriously, try wandering into Cold Storage and picking up a bottle of St Germaine (the other name it goes by). I M P O S S I B L E . So as you can imagine I was absolutely ecstatic when P's mama passed us a bottle of Elderflower liqueur that she got it from Vom Fass at The Shoppes at MBS (now I know where to go). Another awesome thing about Vom Fass (which means from the cask) is that it offers all of these amazing liqueurs, spirits and oils, in various bottle sizes. Useful for those of you who just want to sample something new. This liqueur is just right on its own (with a splash of sparkling water), but it's even better when combined with cool, clean spirits like gin, vodka, or better yet, bubbly! The interwebs is full of helpful suggestions on some sensational options - Grapefruit, Elderflower & Gin is one of the ones I want to try at home when I get my hands on a grapefruit, and there are the usual Elderflower Champagne cocktails - but I wanted to use what I had lying around at home. 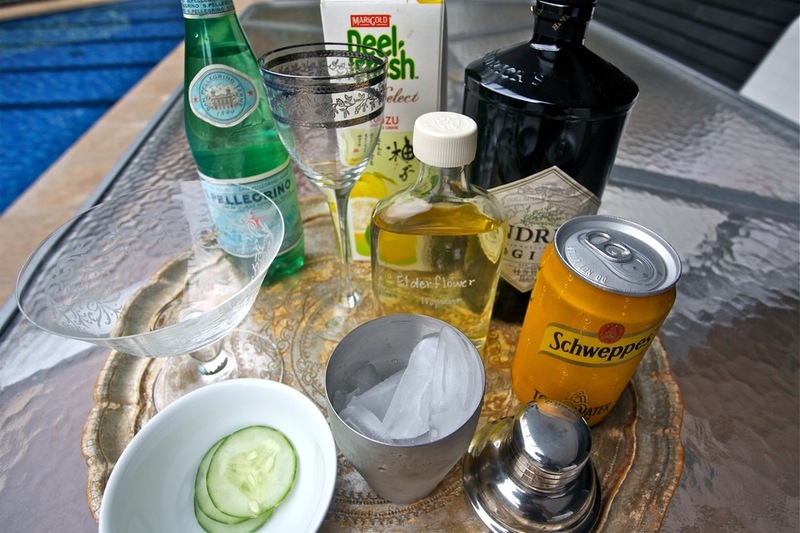 In a shaker filled with ice, pour in the gin, elderflower liqueur, yuzu juice and cucumber. Sh-sh-sh-sh-shake it. Strain into a cocktail glass (taking care not to let the cucumber seeds slip through), fill it to the top with soda/tonic/sparkling water and garnish with a slice of cucumber. If you're wondering why the addition of cucumber, I found it helped to balance the sweetness of the yuzu and the elderflower as it's very crisp. You don't have to add it. Cucumber is also a beautiful compliment to gin - I rarely have gin-based cocktails at home without it. I didn't have any soda at home, so I tested it with tonic and sparkling water. If you're serving this drink at night with food, I'd recommend going with tonic as it's a little stronger, if you intend to serve it in the day (perhaps by the pool or at a picnic), then opt for sparkling water. Either way it's pretty delicious. 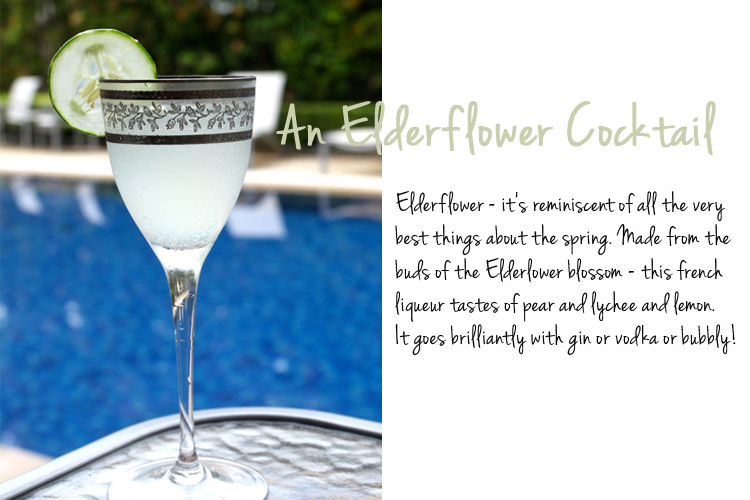 Credit where it's due: Pictures by me and there are lots more elderflower cocktail ideas available over on Metromix.